I have had more than one person ask, Is he rideable? That is the plan. But then, that was the plan four years ago, so I can understand their hesitation. 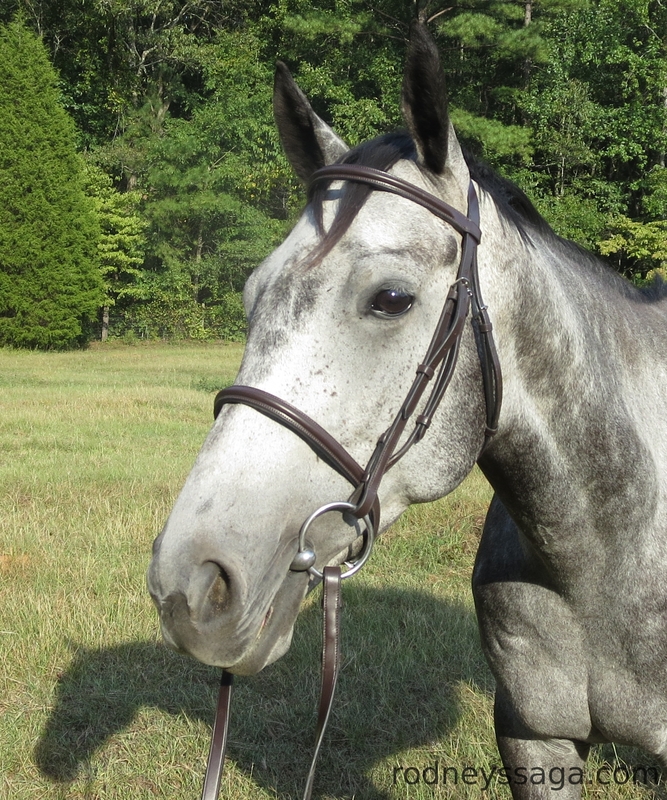 Everything about this horse screams “suitable for eventing”. We shall see how he feels about banks and ditches and water. I’m predicting he will either love it or at least tolerate it enough to be happy at Novice & Training & and maybe one Prelim as a bucket-list item. And wouldn’t that be lovely. Milton doesn’t have Rodney’s gobsmacking good looks, but – cross fingers – he will make up for it with a level head. Yes, Rodney really is that gorgeous. If I’m going to hit my head against a wall, it might as well be a wall made out of gold bricks. However, if my goal is to compete, better a 7 mover in the ring than a 9 in the pasture. 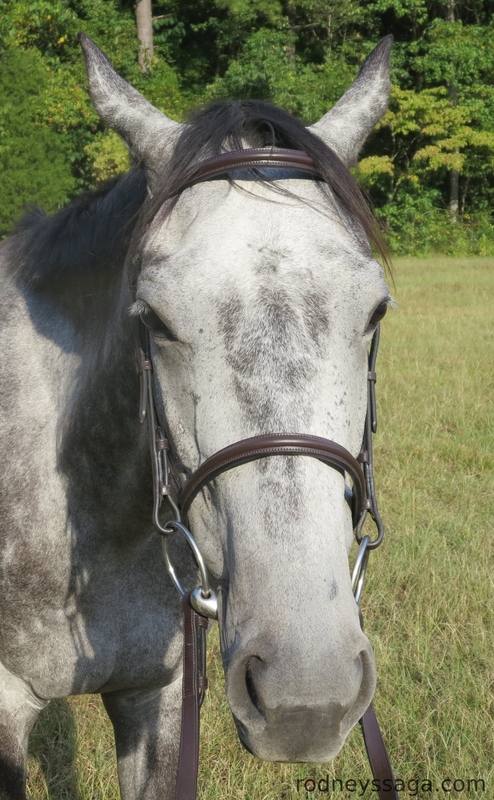 Above, Milton models the second Milton-specific purchase, his new bridle. The first was a white bucket wherein to carry his meals to the barn. Rodney’s is green. Mathilda’s was blue and is buried with her. The bit is Previous Horse’s old dressage bit. Dunno what Milton will ultimately be comfortable with, but this one is big and soft and a good place to start. 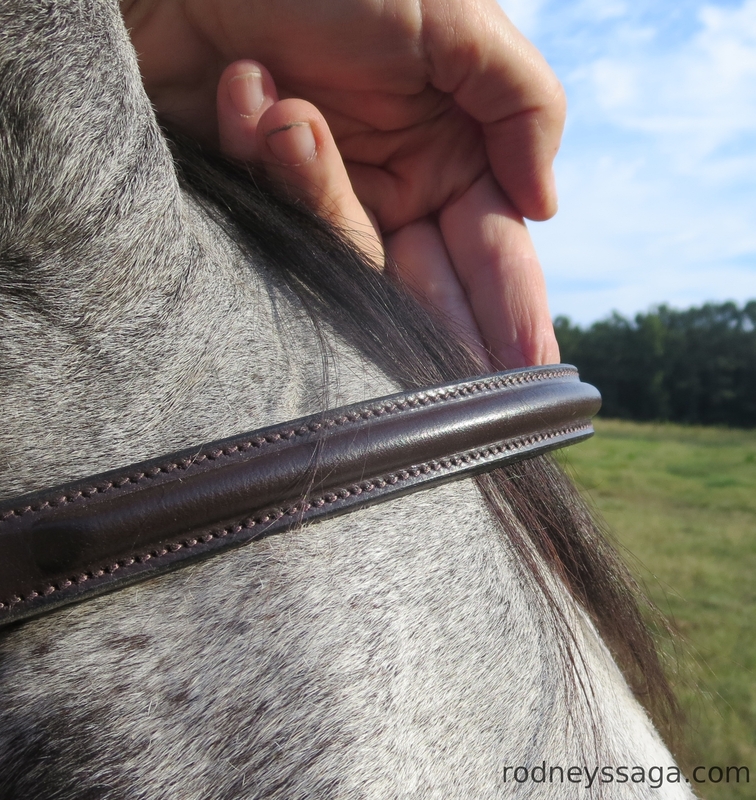 Looks like the browband will be a problematic fit. 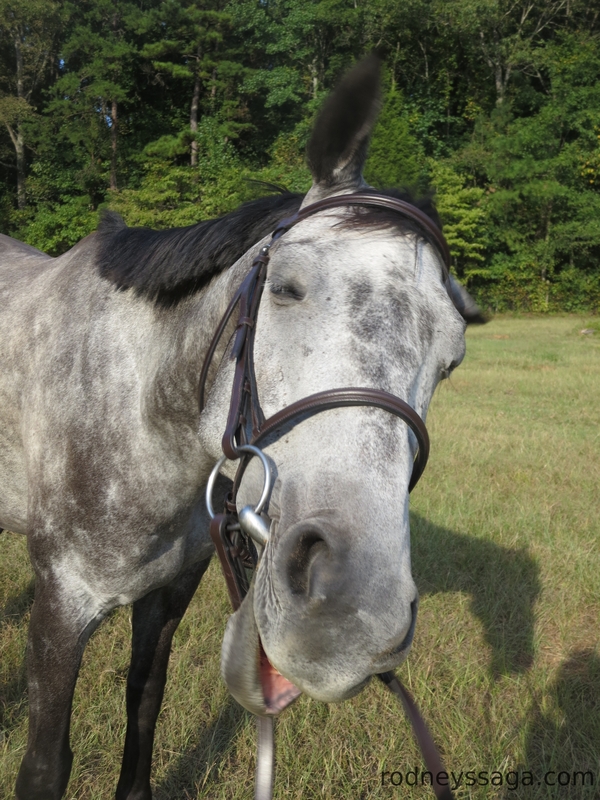 Oh well, Milton is likely to get the hand-made, custom bridle that I canceled for Rodney. Rodney will continue on his quest to wherever he is going. Nothing says I can’t take two horses to the AEC. It has been suggested that Rodney might even benefit from not being the center of all my emotional energy. Staying with, kinda. I will finish out this show season, with possibly another shot at National Academy. After that, I will show enough next year to complete an ASHA awards program. The points have to be earned three years in a row. If I stopped now, I’d have to start all over again. After that, adieu equitation. However, I will continue with weekly lessons at Stepping Stone, with more of an emphasis on performance. The specifics are different, but learning to concentrate with an ASB will help me to concentrate with the TBs. Plus, it will still be good for me to get out of the house among the three-dimensional people. Well, I needed content [Idea Request Accompanied by Barrel-Scraping Noises]. Now I have 16.1 hands of content. OTOH, I may get so caught up in playing with the new content that the blog wanders off. That wouldn’t be the worst thing. I’m wearing a bridle. BFD. He’s very good looking. And I love the black mane.